Peak Tone 6 offers the Momentum for dynamic developments. Each trecena presents a Divine Order of thoughts that naturally elevate our Consciousness. Tone 6 establishes a Rhythm and Pattern of Movement. These are the same Intentions of thought that Human processes naturally each day. Each Tone represents an Hour of Solar Light. 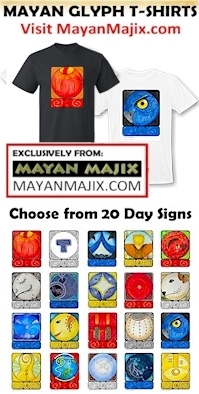 The Maya calculate the Hours of Light from 5am to 5pm. First we wake up from a Dream and are Inspired to do something. Then, we figure out what it will be. Just like Tone 2, we think about the challenge of the task. We settle on a Reason that will be our motivation to get it done. The 13 Tones are a Divine Rhythm and Pattern of the Movements of Human Creation. Our Divine Knowing follows an order of thoughts to manifest Creation. Through the Gift of Consciousness, we Know the Spirit is moving us in a Divine Direction. We won’t see any experience as unworthy for an application of Divine Discernment – a Possibility of Love. Tone 6 is the hour before Noon. In the natural order of things, everyday, around this same time, we see we’ve figured out Our Way. We might have started stuffing envelopes, one at a time. By end of morning, we have a system, our most efficient way of doing it. We’ve got something going. As we get ready to break for lunch, we have an idea of what we could accomplish by the end of the day, based on the pattern of movement we’ve put in place. Now we’re prepared for our Highest Accomplishment. 6 Dog/OC demonstrates our Highest Accomplishment as Love. Dog/OC and Monkey/CHUEN are said to hold an affinity, side-by-side at the center of the Tzolk’in. In the CHICCHAN trecena, they reside together in the Hour of Human’s Highest Consciousness. Dog and Monkey demonstrate the Divine Flow of thoughts that manifest the Creation of Love. MASTER NUMBER 66: This is the 6th Tone in the 6th uinal, representing the Master Number 66. Number 66 doubles and amplifies the vibrations and energies of the number 6. Number 6 relates to the Provision of Love, as service to others, home and family, domesticity and social responsibility. Tone 6 represents a state of Grace and Gratitude. Number 66 is a powerful number of unconditional love, healing and faith and trust in the Divine. Number 66 is a Divine Message to put your faith and trust in the benevolence of the Universe as our needs are continually met. 66 is the inspiration for positive thoughts. The Number 66 is a message from the Angels to balance our physical, material and spiritual lives. Living with a purpose of Love, we will always manifest our goals, desires and wishes. The Number 66 marks the Gift of Knowing that Love will always find a way. The Higher Intention of this Time and Place is a Consciousness of Momentum. The uinals and the leaders of the trecena offer a context to discern the Divine meaning of Now. We are growing to maturity in this cycle of transformation. Tone 5 Empowered us with the Consciousness of all our Divine Resources. We are beginning to See and Acknowledge our own Wisdom, and we’re becoming aware of our own Consciousness to apply the Wisdom of our Spirit. Like Ian Lungold said, “What you pay attention to, you become Conscious of.” After taking inventory of all we can Know, Tone 6 is the inspiration to Dive In to be carried by a Truth of Love. Tone 12 is the day of Understanding. Offering/MULUC offered us the clarity to See the Gifts of Life that would manifest our own Reason To Be. We Acknowledge a Debt to the Creator that we are Willing to repay as our Offering of Sacred Exchange. We were given the Keys to the Kingdom. Today our Heart Believes our own Truth, that we are standing at the threshold of our Divine Destiny. Dog/OC uses Unconditional Love to move Knowledge from the Head to the Heart. We’ll see more than our own possibilities. Dog is the symbol of the Creator’s Unconditional Love. As as nahaul that lives in the pack, Dog sees the Happiness and Well-being of the Whole as important as its own. On 12 Dog/OC, the Dog will bring the Wisdom of Love to guide our Way. On Tone 12 we take something to heart. Tone 12 holds the Ah-ha moment of Truth that we Remember. Truth becomes more than just a theory, we see clearly how it will make a difference in our life. We’ll recognize the simplicity of a small Truth and the Power it holds to change our whole outlook on Life. The trecena of Transformer/CIMI prepared us for a Major Life Change, with a Gift of Seeing a Blessing in our Future. Each Ascension is built on the last. Storm/CAUAC offered a Revival of Spirit. Through a Lightning Charge, we Saw the Light that Who We Are, is exactly what we were Meant to Be. CAUAC reversed the poles of magnetic attraction. We are no longer bound by the gravity of the world. We’re Free to Rise as we are Drawn by the Unseen Hand of Divinity. On Tone 5 we receive the Empowerment we need to complete this new climb of Spiritual Growth. Tone 5 is the center of the cube, the point from which all ways and means are organized and made ready for their application. On Tone 5 we realize the Power that will carry us through. We will see that we are in possession of the Greatest Power we could ever hope to hold. Dog/OC resides in the Center of the Tzolk’in, side-by-side with Monkey/CHUEN. Together they represent the Powers that are Central to a Divine Creator of everything. The Dog holds the Power of Unconditional Love. The Monkey holds the Power of Creation. Their Divine Affinity of Power used together represents the Power to Create the most valuable currency there is in the Creation of Unconditional Love. Dog/OC is bringing Home one of its gifts of Love. It may only be a bone, but something in the gift will be different this time. This time we’ll recognize that dirty chewed up slimy bone as a bright and shiny gift of Love. That was the Offering we volunteered for, to look hard enough to see the Love in everything. We’ll see the Sacred Exchange for the Offering – new eyes, and Dogs senses to even Smell the Love of everything. Dog resides in the North will the Wisdom of Love as we Imagined it and Experienced it in our Innocence. We assumed the same Love we knew at home was everywhere. We also assumed the the Love we couldn’t find there, wouldn’t be found anywhere else either. God made a provision for those who waited the longest so the greatest Blessing offered to Humanity could never be anything but Equal. In every Loss of Love where we didn’t have a choice, or couldn’t see the choice, we hold the Promise of Love that we are going to receive. The Sun/AHAU trecena leads a journey of creation, accompanied by the Supreme Creator. Each Day is the Sacred Event we were given in the Light of the Creator’s Love. Each trecena represents the 12 hours of Light upon which we Ascend every day. Every day, we are presented with a new journey. Every day a whole new canvas of life is given for the Creation of Love. We are changed by every experience we create. Each day we can apply the Creator’s Intention to Love from the Beginning. If human could love from the beginning to the end of a single day, we’d shine a Light of Divinity. We would fulfill our whole Divine Meaning and Purpose in one day, if we could do it. Tone 11 is the 11th Hour. The day is nearly done. We’ve watched the Sun travel across the sky. In the hour the Sun makes its way to the Western horizon, we see the Whole. On Tone 10 we claimed the Truth of Manifestation. On Tone 11 we see the full distance we’ve covered. Tone 11 is a Day of Resolution. All the pieces come together that will put together the Divine Intentions for a New Day and a New Way of Living. Tone 11 presents us with the Here and Now to comprehend a new horizon, a new starting place. Offering/MULUC gathered all our Love together to frame it as an Offering. All the human love we share was given a Divine Direction and a Source that Defines the Place. Our human love is transformed into Divine Love, when it’s given to the Creator. Given back to the Source, our Love will be Given as an Act of Divinity. We can shine our Light through the Sun, as the Center of Everything, and the One Divine Light that always exchanges Life, Love, and Happiness. Dog/OC is the symbol of the Creator’s Unconditional Love. On Tone 11, the shaman climbs to the Highest Altar to make an Offering and Receives the Atonement for a Divine Discernment. Dog/OC leads us to a Higher Discernment of Love. Everything we need to know about Love, we can learn from the Dog. 11 Dog/OC (KIN 50) is a Portal Day that magnifies our experience through a thinning of the veil. A channel is open to the realm of Spirit. We can experience the closeness of the Creator through a magnification of Unconditional Love. Tone 3 holds the Intention of Movement. The Movement of our Body and Breath creates a Vibration. The frequency of the Vibration we bring to Life is determined by its Intention. We are Beings of Vibration, Earth raised up by the Vibrations of Life. If our Human eyes could see the Whole from the Micro to the Macro, we could conceive the Truth that each of us are a body of Earth’s elements vibrating at our own frequency. Frequency and Vibration rearranges the patterns of the matter of who we are. Our Being responds and functions differently from one vibration to another. Human’s vision is a perfect example. The colors we are capable to see are limited by the frequency our eyes are capable to see. There are more colors. If our eyes were no longer limited to that same range of frequency, we would see them. So is Human discernment correspondent with the Vibration of our Thoughts. The range of our thoughts defines the Vibration of our Spiritual Discernment. Dog/OC is the Day Sign of Unconditional Love, a Pure Tone of Love in its Highest Vibration. We can Direct our Vibration by Choosing what we think. Tone 12 holds the Intention of Understanding. Truth moves from the head to the heart. Through a gift of Retrospection, we’re able to fit disassociated pieces of information together to form a new functioning whole. We could compare Tone 12 to the last scene of a movie, that answers all the unresolved questions, complete the context, or convey the lesson learned. Eagle/MEN raises us up for a heavenly perspective. MEN is the Intermediary that shares its High Hopes and Aspirations for the Future. Through the eyes of the Eagle we can see our Dream in the Future. Eagle’s are said to be successful in business by their ability to see things ahead. 12 Eagle/MEN will seat a new Understanding of Truth by sharing a vision of our Future. This is a vision we have to see for our Self. Our eyes are opened to see things clearly, and from a realm above we are given an unobstructed view. Portal Days thin the veil to other dimensions, and magnify our Spiritual Gifts of Knowing. A Portal will magnify 12 Eagle/MEN’s Vision of the Future. We can Believe in a future that we see as if we are already there.